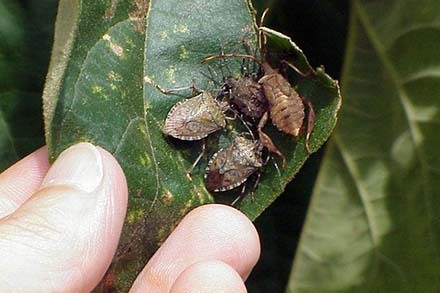 The brown marmorated stink bug will feed on tree fruits, small fruits, vegetables and native plants. Photo Courtesy of: The Bugwood Network at the University of Georgia and the USDA APHIS Plant Protection and Quarantine program. First it was the multi-colored Asian lady beetle (MALB) invading Eastern vineyards and imparting a nasty flavor to the wines. Now it’s a stink bug from China. The East has always had several kinds of native stink bugs that have co-existed with orchards and vineyards without causing any major problems, mostly because these half-inch long, shield-shaped insects did not seem to feed on fruit.